It has been hardly one year since Ahmedabad received the World Heritage City tag from the UNESCO. Within hours of Uttar Pradesh announcing the renaming of Faizabad as Ayodhya, its counterpart Gujarat said it was keen on rechristening Ahmedabad as Karnavati, subject to legal hurdles. This is not the first time that the issue of renaming Ahmedabad, which has a glorious history of over 600 years, has come up. Now with 2019 Lok Sabha elections only a few months away, the talks appear just “politically motivated”. In 1988, the BJP-ruled Ahmedabad Municipal Corporation had passed a resolution to rename Ahmedabad as Karnavati. After further approval, the state government had forwarded the proposal to the Centre. However, the proposal was rejected. There were two petitions against the renaming in the Gujarat High Court. These petitions, however, were later withdrawn. Vanraj Parghi, a lawyer, who is in the knowhow of the petitions and the developments, tells THE WEEK that then Union minister George Fernandes had said that there was no plan of the Centre to change the name. The petitions were then withdrawn, he said, adding that if any move comes now, it would have to begin again from the municipal corporation level. In the 11th century, the area around Ahmedabad was known as Ashaval, the name of the Bhil king. Karna, a Chalukya king, waged a successful war against the Bhil king and set up a city on the banks of the river Sabarmati. 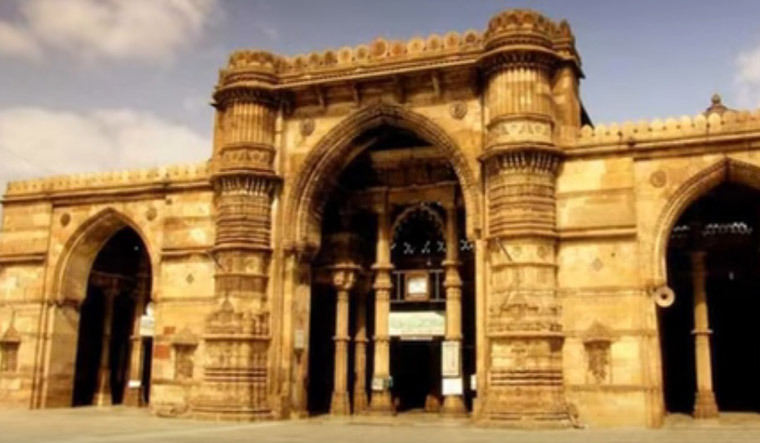 It was Sultan Ahmed Shah who laid the foundation of the walled city in Karnavati in 1411 A. D. and named it Ahmedabad. Renaming Ahmedabad as Karnavati probably will not be as easy as changing the name of Faizabad to Ayodhya. Had it been so easy, the BJP would have done it much earlier, for it has been in power in Gujarat for over two decades. The party has also been in power at the Centre for the last four and a half years under its strongman Narendra Modi, who hails from Gujarat. It is no wonder that the other day, while talking about Karnavati, Gujarat Chief Minister Vijay Rupani placed a rider. After offering prayers at a temple in Gandhinagar, Rupani said that they were contemplating changing the name of Ahmedabad. He, however, said that concrete steps would be taken after taking into consideration the legal process and other angles. It has been hardly one year since Ahmedabad received the World Heritage City tag from the UNESCO. It was primarily on the basis of the architecture in the walled city, credit to which goes to Ahmed Shah. Changing the name of the city would amount to denying the very thing which the government had once glorified to get the Heritage City tag. Political analyst Hari Desai firmly believes that though the BJP talks about sab ka saath, sab ka vikas, when it comes to elections, it tries to consolidate and please its Hindu vote bank. “It only shows that you are changing the name because it is of a Muslim. If you are to see the history, then why Karnavati,” Desai asks, pointing out that earlier the city's name was Asahvali. Ashram and the famous textile mills are associated, Jani adds. Noted dancer Mallika Sarabhai said that when Ahmad Shah founded the city, there were some hamlets around. “One of them was ruled by a chief called Karna Dev. That was not what became the city. Ahmad Shah planned and executed this city, the forts, minarets, pols and mosques, the Jama Masjid, which is the first in the world to designate a prayer area for women, and much else that is our heritage. The UNESCO tag is largely because of his and Mehmood Begda’s vision. And the builders of the modern city from Ranchhodlal Chhotalal to Sardar Patel to Kasturbhai Lalbhai and Vikram Sarabhai envisioned a city where the great minds of the world, from Charles and Ray Eames to Le Corbusier to Buckminster Fuller to Louis Kahn came for an inclusive and international world city,” Sarabhai said. She further said that let us not colour it to parochialism by wiping out our proud and syncretic city.